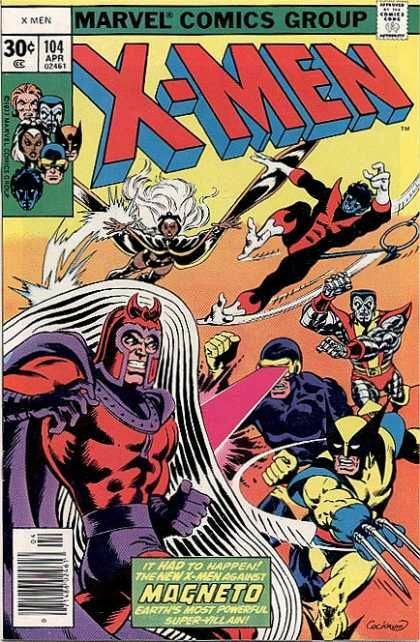 We got the chance to see this new team of X-Men in the now wildly popular and expensive Giant-Size X-Men #1, along with their introduction in the regular monthly title at issue #94. From that issue to that which we review now, they’ve had a rather rough road. Sentinels, Cyclops’ brother Havok, the rise of the Phoenix, Juggernaut and themselves, there really is only one other adversary they really need to face. That’s right! Magneto! With all the reprints in the issues leading up to #94, these past ten issues are no doubt a welcome read to fans at that time. It’s a new team, a fresh group of guys and gals, and several nationalities. German, Russian, Canadian, you get the idea. It’s the X-Men like they’ve never been before, and even more diverse now. Are they strong enough as a team to handle the X-Men’s greatest villain? Does Wolverine get along with anybody? Isn’t the homage of the first issue’s cover cool? We’ll answer all that and more as we review X-Men #104! It all starts on a dock in Scotland. The X-Men, consisting of Storm, Colossus, Banshee, Wolverine, and Nightcrawler, are trying to gain access to a hovercraft they previously paid to use. The owner of the boat is a jerk, especially to costumed freaks. Thinking to make a quick buck, the owner of the boat “attempts” to tell the X-Men to go pester a rock in the middle of the road, when the X-Men just take the boat anyway. It’s not like the stole it, after all, the guy was going to keep they’re money. The X-Men just took what they paid for. Anyway, onward to Moira MacTaggert’s research island, when out of the blue, the metal craft they were on flies apart! What could have done this? Our X-Men are fearless, though, as they drag themselves to shore. Collecting their thoughts, they try to make their way to the laboratory, when again they are stopped, this time by some sort of force field! Cripes!! Seconds later, the ground is pulled from underneath them, and they are thrown through the air toward the steel walls! With all their efforts, they blast through certain death, crashing to the floor below. Who else is there, standing before them, relishing in their defeat, than the master of magnatisim, Magneto! Things are not looking good here. Chris Claremont is one of the best X-Men writers EVER, and with good reason. You get exactly what is promised in this issue. Each character feels unique. Nothing feels copied. Wolverine is full of, well, Wolverine, Nightcrawler is light-hearted, Colossus is stout and proud, and Banshee brings up the leading aspect, written very well by Claremont. The action flows, and from one panel to the next, you can feel yourself rooting for the X-Men, even as they get it handed to them at every turn. Wolverine’s claws are metal, which means Magneto has control of him. Colossus’ body turns to steel, which makes him a deadly weapon against his friends. With the ability to sense disturbances in the magnetic lines of force (Claremont’s words, not mine! ), Nightcrawler’s moves are predicted seconds before he can act against Magneto. One after another, the X-Men fall, until only Banshee remains. Claremont makes it look hopeless, as this new team, who are all still very much new to this, fall like flies against a seasoned villain. Banshee holds, but not for long, as he falls too. It’s a great story, one that Claremont made into a promised slug-fest. We’re only allowed a few pages of story development before the action starts, and it doesn’t stop until the last page. Claremont’s writing is clear, effective, and a lot of fun to read. Let’s start with that cover first. Dave Cockrum‘s homage to the X-Men’s first issue is awesome. Compare the two and you’ll see it. Nightcrawler in Beast’s postion. Substitue Wolvie for Iceman, Storm for Angel, and Colossus for Jean Grey. I love it when artists take the time to do stuff like that. It’s a great way to give tribute to the past while keeping it fresh for the future. Now, on to the interior art. Cockrum’s work is amazing. There is much attention to detail, what with emotion and pose. You can feel the tension at the boat docks as the X-Men are forced to deal with bigotry yet again. You get excited as you watch the team go through so much, visually, at the start of the issue, and then, when Magneto appears, you’re filled with awe and dread, all at once. A full page spread devoted to the master of magnatisim himself, and what a page it is. It doesn’t stop there. The action heats up with Cockrum’s artwork as we watch the X-Men fight. Determination, fear, and rage are all expressed vividly as Dave Cockrum takes Claremont’s script from panel to panel. The one mutant who sees the least action, believe it or not, is Wolverine, and I don’t really mind that. Don’t get me wrong, I love the little guy, but I’m very glad that here, he doesn’t hog up all the action. Most is seen between Colossus and Banshee, and they don’t disappoint. Cockrum’s artwork shows their bravery, but ultimately, it’s Magneto who comes out triumphant. Cockrum’s work makes this issue worth it on visuals alone. Last week, I talked about how much I loved 70’s comics, and here, Marvel does not let me down. Like the Flash issue from last week, this holds true to being just a hugely fun issue to read. It’s not misleading in any way. It is what it is. A fight between Magneto and the new X-Men? Count me in! From front to back, it’s filled with this action and entertainment that only Marvel could bring. Mind you, DC had it going in it’s own right, but here, the stories feel different. With this issue, we’re plunged into the middle of a storyline, with affects from last issue hanging heavy here, and the last page leading directly into the next month’s pages. It feels to me that DC was very singular in it’s storytelling, for the most part, while Marvel dove deeper into rich and character driven storylines, spanning more than two issues. Both have their benfifits, but here, I like Marvel’s just a little bit more. I think this is why, in my opinion, Marvel has more memorable issues from this time period than DC does. Some of you will argue me on this, and give me a list of issues as to why I’m wrong, but I think Marvel just did it a little better during this time of comics than DC. Call me crazy. Claremont’s writing is superb here, and with Dave Cockrum’s artwork, any X-Men fan, let along comic fan, will not be disappointed in what they read. It’s classy, action packed, and rich in Marvel lore. Can I say it? Should I? I should say it. Heck, I’m gonna! MAKE MINE MARVEL!! Parental Concern: None. Magneto might be a little scary, but that’s only because he demands you to fear him.